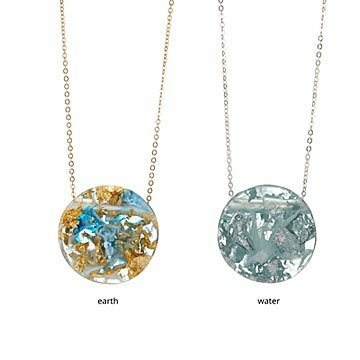 Abstract eco-resin and gold or silver leaf pendants honor your elemental corner of the zodiac. Whether you're a fiery Leo or an airy Libra, Tulijanna and Alejandra Garces' boldly abstract accents honor your elemental corner of the zodiac. They embed clear disks with ribbons of color and gold or silver leaf to represent the four elements—air, earth, fire, and water. But on the materials level, each pendant is an earth sign because they're made with wood-derived eco-resin, a completely renewable alternative to synthetic or petroleum-based materials. Suspended from 18-inch, 24-karat gold or sterling silver-plated chains, they're presented on gift cards that include the zodiac symbols and characteristics of each elemental group. Handmade in Colombia. Eco Resin (pine resin based, not petroleum based), 18”, gold and silver leaf, 24Kgold - .925 Sterling Silver plated chain. Please do not submerge in water. I liked it and i was very pretty. I love the gold accents and the color is perfect. I got the water for my mom since we live on the beach in CT. I would get it for friends, family, etc. Can this get wet? I wore it in the shower because I have a hard time getting it in by myself and it seems like the plastic Coating is coming apart? I ordered this necklace (aqua) for my mom for Christmas. I love supporting small business and this necklace is fine, but for for the price looks and feels a little cheap. The chain is also not as long as I hoped it would be (which is hard to gauge just having a written length).